Although potatoes have a reputation for being unhealthy and high in carbs, they may be better for you than you think. As long as you don't fry them in oil or add a bunch of butter or cream, one whole medium 6 oz potato is only 160 calories (2 weight watcher points). Potatoes are low in sugar, but high in complex carbs that are released more slowly into the bloodstream. They also contain significant amounts of protein and fiber, and are rich in many important minerals such as iron and potassium. Sweet potatoes are also a very healthy choice. Sweet potatoes are higher in sugar than regular potatoes, but also slightly higher in fiber and the same number of calories overall. Like potatoes, they are high in minerals, but they are also high in a number of healthy antioxidants including vitamins A, C, E, and B (folic acid) and the mineral zinc. In fact, it's the beta carotene (vitamin A) that gives sweet potatoes their orange color, so the darker the potato, the higher the vitamin content. An extremely common food made out of potatoes is french fries. Juliet did a posting a while ago about baking frozen potatoes from the supermarket (instead of frying) to make baked lower calorie french fries. 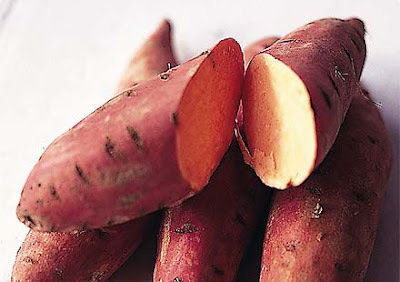 The same approach can be used with sweet potatoes (they make rich, delicious fries) which can be purchased pre-cut at some stores (like whole foods) in the frozen food aisle. Yum! You should try sweet potato fries if you like the taste of sweet potatoes. May I ask what seasonings you use? I'd love to try something new! I either just use Nu-Salt or something yummy and flavorful by Mrs. Dash. And then I always dip 'em in reduced sugar ketchup. MmMm.. now you got me wanting some fries with dinner tonight! I love oven baked fries! Especially oven baked sweet potato fries. I like to put a ranch packet in some nonfat greek-style yogurt as a dipping sauce. Yum! Sweet potatoes are so wonderful. They are tasty in soups, too. You can mix a whole bunch of vegetables with a few peeled sweet potatoes, boil until soft, season and blend for a delicious creamy soup.